Eddy was our 1st dog and he took us on an incredible journey. We picked the name Eddy because it has ties to my teenage hero from when I raced bicycles (famous Belgian cyclist Eddy Merckx), a relevance to fly fishing - (Eddy's in rivers) and Marie's Interest in Mt. Everest (Sir Edmund Hillary being the first to summit Everest). The first year and a half Eddy was our fly fishing, hiking, beach walking, dog tricks companion. 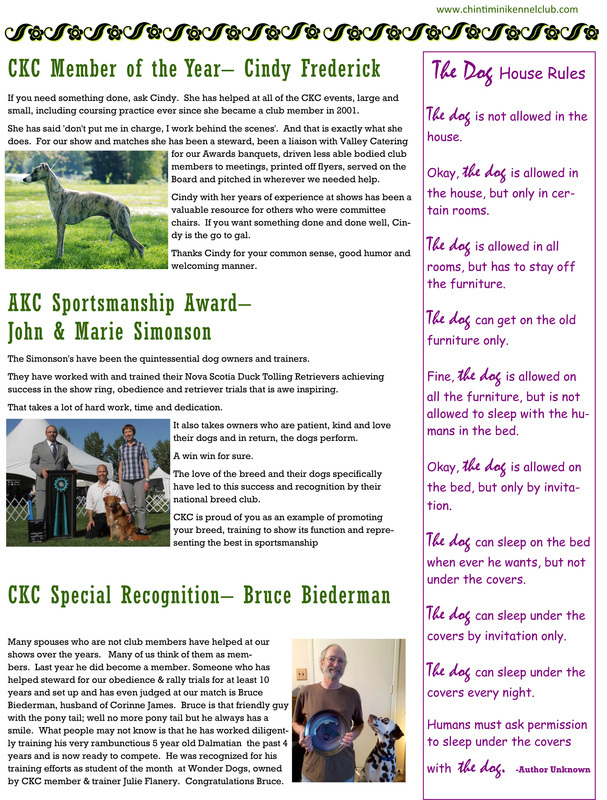 After joining the local dog club we slowly became involved in conformation, obedience, and field events. 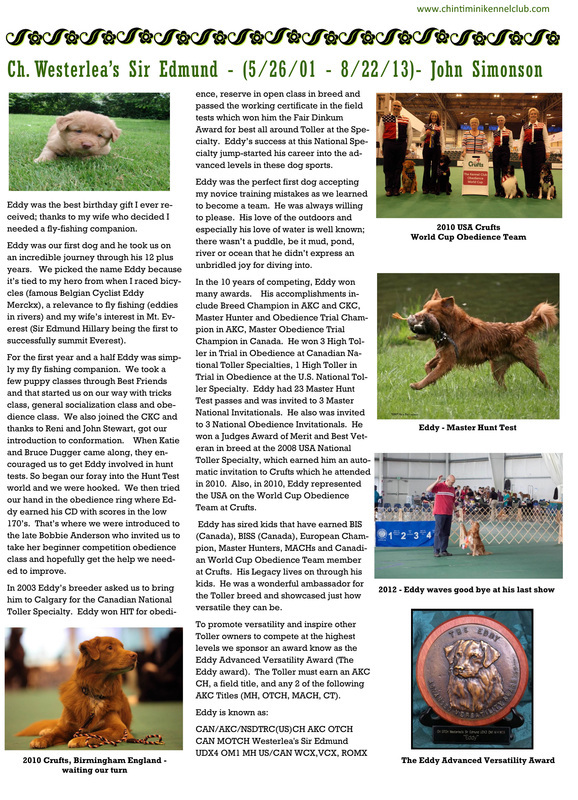 The 2003 Canadian National Toller Specialty in Calgary jump-started Eddy's career in the dog sports world. Eddy was the perfect first dog, accepting my novice training mistakes as we learned to become a team. He always had a grin and was always willing to please. His love for the outdoors and especially of water is well known and there wasn't a mud puddle, pond, river or ocean he didn't express an unbridled joy for diving into. He made us laugh. Eddy passed at the age of twelve. He will never be forgotten and will always be missed. He left a huge hole in our family. Though it seems like such a short time to have shared with him, it is a lifetime of knowledge he taught us about loyalty and friendship. Eddy made us incredibly proud by way of his devotion and friendship. We've competed at Crufts in England, National Obedience Invitationals. 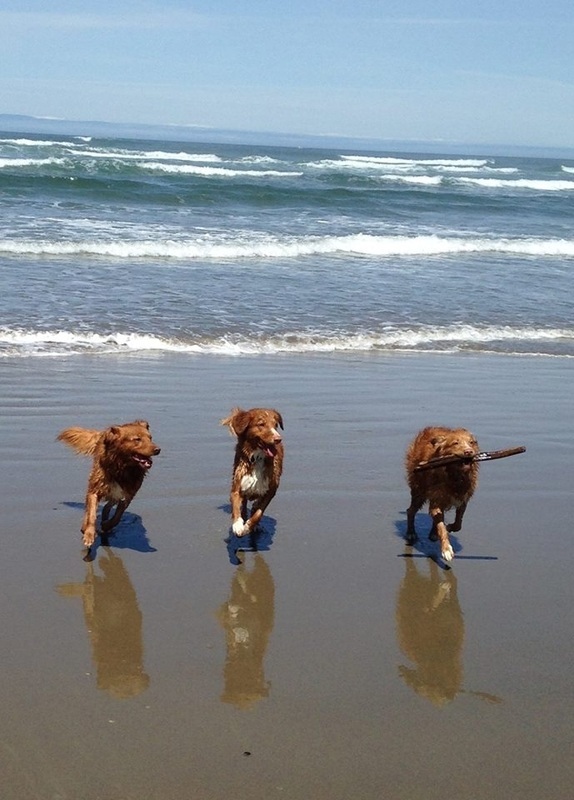 Master Nationals, National Toller Specialties in both the U.S. and Canada. 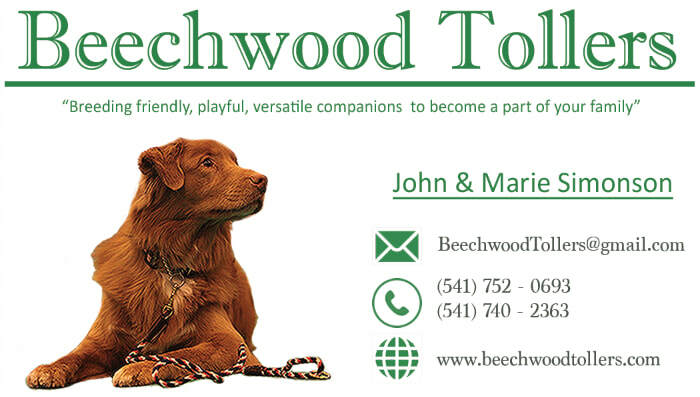 He's won 3 Canadian and 1 American National Toller Obedience Specialty. Thanks to my wife Marie for thinking I needed a fly fishing Companion. He's the best birthday gift I ever received.